In the following guide, we aim to answer that question by offering an in-depth review of the best camping headlamps currently on the market and a detailed analysis of what goes into the making of the ideal headlamp for every type of adventure. Let’s start off with our top picks of the best camping headlamps per category for 2019. How To Choose A Headlamp For Camping? The Black Diamond Spot Headlamp is an impressive little headlamp, but one that you might overlook at first because of its simplistic design. In reality, this just might be the best headlamp for campers. The Spot is actually an extremely capable model that has a no-frills appearance combined with some high-tech components. The Spot is outfitted with one Quad Power LED and one Double Power LED, which emit a total of 300 lumens. You also have the option to dim the Spot for when you don’t need as much brightness. This conserves battery and will raise the 30 hour burntime (on Full) to an impressive 175 hours. Any camper that is looking for a moderately bright, waterproof headlamp that offers a range of different modes and is priced for $30 or less. This would be an excellent first headlamp or a seasoned campers extra headlamp to keep on hand. It’s compact size also places it as the best backpacking headlamp. 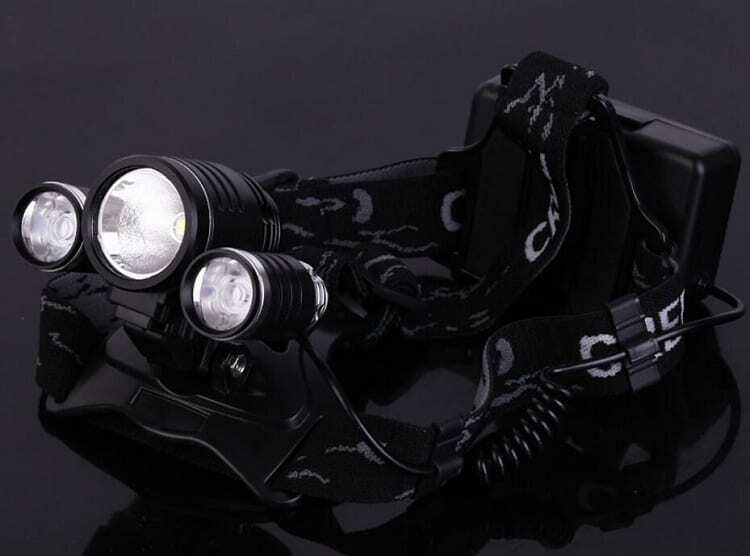 Although it wasn’t able to beat the Black Diamond Spot, we feel that the HG Headlamp is worthy of an honorable mention. The HG Headlamp’s official name on Amazon is a bit of a mouthful, but it’s actually quite a well-designed headlamp for general use. In fact, its overall design is more complicated than standard LED headlamps, which might appeal to campers that like “techy” gear. The “4 Lighting Models” in the HG Headlamp’s name actually refer to the 4 light modes it offers. These modes include Main Light, Side Lights, All Lights, and Strobe. The lights themselves include four smaller side lights surrounding one main light. Campers that want a heavy-duty headlamp, priced under $30, that has a unique design. This model has an intriguing look, but be warned that it’s pretty heavy and you may tire from wearing it for long periods of time. When you need the brightest headlamp possible, that’s still easy to wear and use, our choice is the the Cobiz Brightest High 6000 Lumen LED Headlamp. Brightest isn’t always best for every situation, but for campers wanting maximum illumination, the Cobiz is a definite winner. There aren’t many headlamps that have 6000 lumens – or even close to it – which makes the Cobiz look more like a tiny spotlight on your head than a standard headlamp. Despite its intensive lumen level, the Cobiz is actually fairly compact and comfortable to wear. The design of this headlamp includes a total of three LED lights, with one main light and two side lights. There are four light modes, which include High Beam (main light), Low Beam (side lights), All Bright (all lights), and Strobe (all lights flashing). Anyone that values having the brightest headlamp possible will really enjoy the Cobiz. Although it’s probably far too bright for inside tents or if you’re not trying to wake up fellow campers, it’s ideal for activities like night hiking, gathering wood, setting up shelter, etc. 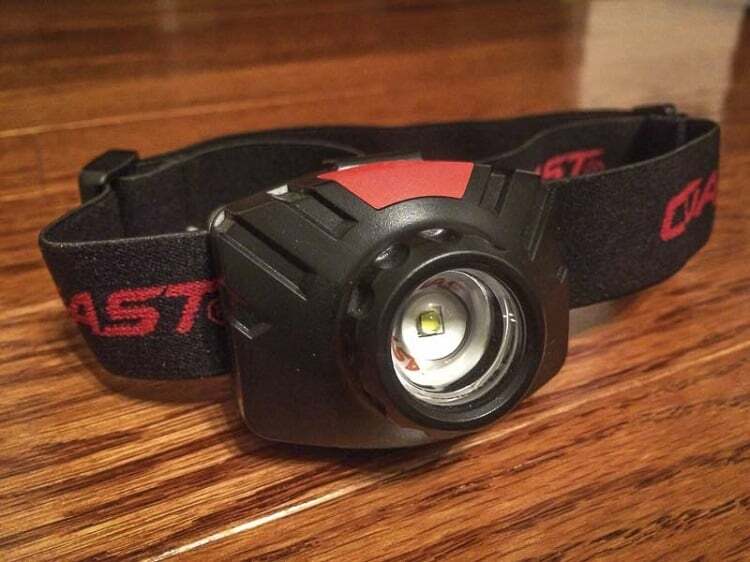 Black Diamond made our list again with the Sprinter Rechargeable Headlamp. The Sprinter is similar to the Spot, but has a few key characteristics that make it perfect for all different types of activities. The Sprinter hs a single TriplePower LED which puts out 200 lumens on the max setting. Since it was originally designed with runners in mind, the light projects outwards in front with an oval beam. Located on the back of the Sprinter is another LED housing with a red strobe taillight. This improves runner visibility and will also help with safety for campers. Black Diamond also added an overhead strap to this headlamp to ensure that it stays in place while moving around. This is an important feature when you’re looking for a lightweight headlamp that can handle bouncing around without sliding. Campers that will be doing a lot physical activity on their trip will find the Sprinter to be a great choice. This headlamp would naturally be the best headlamp for night running or jogging, which is something campers may keep in mind if they do those activities at home. It’s impressive 5 hour quick charge also makes it the best rechargable headlamp. New campers or campers that need backup headlamps will get the most use from these headlamps. Since they are incredibly budget-friendly, they’re an easy choice for campers that aren’t yet sure how much use their headlamp will get. They are great to have in your car, RV, and around your home for emergencies as well. Finding a well-designed headlamp that’s under $20 can be tough. But not only did we find a worthy model that’s less than $11 – it also comes in a 2 pack! 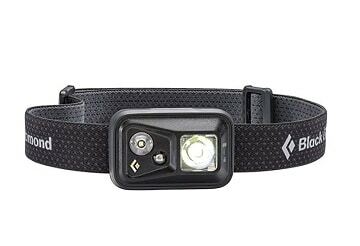 The EverBright 2-Pack Headlamp is loaded with features and even comes with a 12-month warranty to back it. We’ve found that these headlamps are surprisingly tough and easy to use, while still being lightweight and full-adjustable. EveryBright decided to use 30 lumen LEDs for these headlamps, and though that may seem very low, it’s perfect for up-close activities (cooking or reading a map) and to use inside tents. There are a total of 8 LED bulbs inside the housing with 4 different modes. Brightness modes include Low (2 bulbs), Medium (4 bulbs), High (all 8 bulbs), and Strobe. 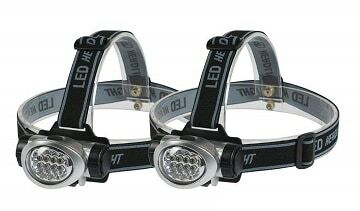 These headlamps use 3 AAA batteries which offer 5 hours of continuous use. Overall lifespan of the bulbs themselves is 100,000 hours. Choosing a headlamp can be as straightforward as just buying the first one you see, but we recommend you do a little research. Just as you wouldn’t buy a tent without brushing up on the basics, spending a little time learning about headlamp options is a good idea. As far as size goes, headlamps aren’t categorized strictly, but the activity the headlamp was designed for will generally play role in how big or small it is. Headlamps designed for backpackers will be the most compact and lightweight, even more so than headlamps designed strictly for casual campers. The reason being that backpackers need to conserve weight as much as possible. Headlamps designed for at-home use, car work, construction, and similar uses tend to be larger overall in terms of bulk and weight. Depending on what you plan on doing while wearing your headlamp camping, these options might be a bit overboard in terms of size. Most campers will do best with compact headlamps with smaller-sized lighting housing. Headlamps for camping are almost always designed with LED bulbs. LED bulb brightness is measured in lumens, which is a term used to describe the amount of light the bulbs emit. The higher the lumen level, the brighter the light. How much brightness you need is really a personal choice, but take into consideration that the brightest headlamp isn’t always the best. While you’re camping you’ll likely be using your headlamp for up-close tasks, such as meal prep, cooking, reading, and similar activities. Too bright of a headlamp can make it quite impossible to easily view what’s right in front of your face. Super bright headlamps can also be an annoyance for your fellow campers. Being abruptly woken up with a harsh light in your tent because your partner needing to make a trip to the bathroom isn’t pleasant for anyone. For general use, stick with a lumen level that’s between 100 to 300 and look for headlamps that allow dimming. Durability is important for any piece of gear you take out camping and headlamps are no exception. You should select a headlamp that is strong enough to handle accidental drops, with either a metal or strong plastic housing. The acrylic barrier directly in front of the LED bulbs should also be crack-resistant. Although it isn’t an absolute must, we strongly recommend selecting a headlamp that’s water-resistant. That way a surprise rainfall or an accidental drop in puddle or creek won’t mean the end of your headlamp. The overall adjustability of a headlamp includes a few different factors. Firstly, the adjustability of the headlamp’s straps will be important, particularly for petite women and kids. The majority of headlamps use elastic straps to help get a snug, but comfortable fit on your head. What you want to double-check before purchasing is how well those straps adjust. Secondly, the adjustability of the brightness levels. As mentioned earlier, if you go with a high lumen headlamp you’re going to need to be able to dim it. Some other light adjustment features include strobe flashing, red light for night vision, and proximity. You really can’t go wrong with having plenty of light adjustabilities. Last is the adjustability of the light housing. Some headlamps have a fixed light which can leave you having to position your head in a strange way or end up having to take off your headlamp and hold it like a flashlight, which clearly ruins the point of wearing a headlamp. We recommend buying headlamps that have at least a 90 degree downward rotation option so you can see what’s in front of the feet or hands. Still have some final questions about headlights for camping? Here are four common questions that tend to pop up when you’re buying your first headlamp. The lumen brightness you need directly correlates to how much bright you’d like for your headlamp to be. Camping headlamps tend to have lumen levels anywhere from 15 up to 500+, with even more impressive models going up into the thousands. To put what these numbers mean into perspective, you can consider 10 lumens to be similar to candlelight. Moving up to 200 to 300 lumens equates to the brightness of standard indoor lighting. That will give you a good indication of how bright a 500+ lumen output would be. Campers only using headlamps for moving around a campsite will find that they don’t need much more than a 20 to 60 lumen headlamp. Campers that plan on going out hiking, running, and generally exploring at night should start with a minimum of 120 lumens. How to Make a Camping Headlamp Dimmer? How easily your headlamp dims has to do with its design. For versatility and to ensure you’re not blinding yourself, it’s a good idea to only purchase a headlamp that has a dimmer or “low” setting. This makes dimming very simple. If your headlamp is still too bright, you don’t have many options. You could try dulling the brightness by placing a very thin cloth over the light housing. This will work in a pinch if you’re using your headlamp to illuminate your tent. But be forewarned that covered the lighting housing of any LED headlamp could cause it to overheat! For safety reasons alone it’s not a bad idea to carry your main headlamp along with a low-lumen (15-20) backup. How to Keep Your Headlamp Working After Camping? Taking care of your headlamp will ensure it functions properly for as long as possible. After every camping trip wipe down the light housing and do a quick inspection to make sure there is no damage or that if any of the bulbs have burnt out. You can either wipe down the elastic straps as well or, if they really got dirty and sweaty, remove them and give them a good handwash. After your headlamp is clean you can then recharge it to full and place it back in it’s storage case or some other safe location that’s out of the sun and extreme temps. How Often to Recharge Your Camping Headlamp? Rechargeable headlamps are super handy and will save you quite a bit in the long run by eliminating replacing batteries. Recharging your camping headlamp should be done after every camping trip, especially if you used it quite a bit and are unsure of how many hours it has left. It also isn’t a bad idea to place your headlamp back on the charger before your next trip if there is a big gap in time between the two. This is to double-check that your batteries still have a full charge. Keep in mind that your camping headlamp should only be charged until full, then removed from the charger. This keeps your device and your batteries safe and working longer. Headlamps are a universally useful tool and that means there are a dizzying number of different models and types to sort through to find the right one for you. After reading this guide you will be ready to confidently purchase a quality camping headlamp for your future camping trips. Even if you didn’t quite find the right model for your needs in our Top 5, you’ll still have come away with important knowledge on types of headlamps and how to select one based on important features to help with your search. Did our guide help you finally find the perfect camping headlamp? Perhaps you already have a favorite headlamp that wasn’t featured in our guide? Feel free to share your own headlamp reviews well as any other headlamp advice to help your fellow campers in the comments.